This International Day of the Midwife, we’re celebrating those creating healthy communities and saving lives across the globe. 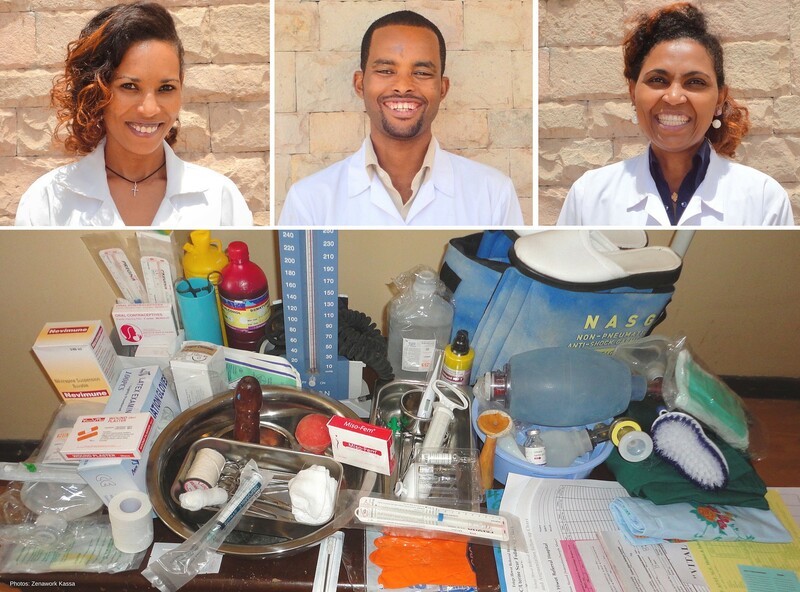 Come with us — from Bangladesh to Guinea — as we peek inside midwives’ bags on a typical day. In addition to their delivery bags, midwives “carry” many other invaluable tools that enable them to provide compassionate and skilled care, including education to women and their families. Yet while we know that investments in high-quality midwifery education can yield a 16-fold return in both cost and lives saved, less than one-quarter of countries currently have enough midwives to meet their demand. On May 5th — and throughout the year — we do well to remember the inextricable link between midwives and meeting our global health goals. Increasing the number of midwives and the quality of their education are key to ending preventable child and maternal deaths and providing universal access to healthcare. Delivery kit: Helping Babies Breathe instruments, leaflets on: family planning, delivery preparation, postnatal counseling and breastfeeding. Sandra has her BS in Nursing and Midwifery, MPH, MSS, and has completed essential newborn care training. She works in the Mirpur slum areas, delivering services to women and adolescents in their homes. “As a young nurse-midwife, I started my professional career checking up on the pregnant women in the community slum area. I was horrified by the situations of the pregnant women and adolescent girls who were suffering with complications because... of unskilled people, superstitions, obstacles for seeking health care during pregnancy, and domestic violence. In consequence, the [adolescent girls] were getting pregnant too early and then facing complications before, during and after childbirth. Midwifery kit: Box delivery, Pinard stethoscope, examination gloves, Ambu bag, suction bulb, syringes, blood pressure apparatus, drum pads, serum, 2% Xylocaine, long glove, clamp. Hawa has worked 15 years at one of two national maternity hospitals in Guinea, coordinating their 30–35 deliveries per month. She received midwifery training through USAID’s flagship Maternal and Child Survival Program and Maternal and Child Health Integrated Project. “Among these materials [in my midwifery kit], the Ambu bag (artificial manual breathing unit for infant) helps me a lot in the resuscitation of newborns because we are a referral hospital and women often arrive tired. With this equipment, we can recover 80% of newborns. Delivery kit: One pair of gloves, two scissors, two forceps, cotton, two metal trays, one tray for holding cotton. Kayezu has a certificate in midwifery from the Karoli Lwanga School. Midwifery Equipment: Gestation calculator, fetal scope, stethoscope, thermometer, blood pressure apparatus, sterile gloves, examinations gloves, aprons, penguin sucker, Ambu bag, infant face mask, delivery pack, Oxytocin, Chlorhexidine for the umbilicus, Tetracycline-eye ointment, blood sample collection bottles, urinary test stripes, Abendazol, Fansida/anti malaria drugs, Ferrous Sulphate, urinary catheter, cold clamps, face mask, surgical blades, labor chart, cannulas tubes, syringes, plaster, surgical sutures, adult face mask, labor chart. 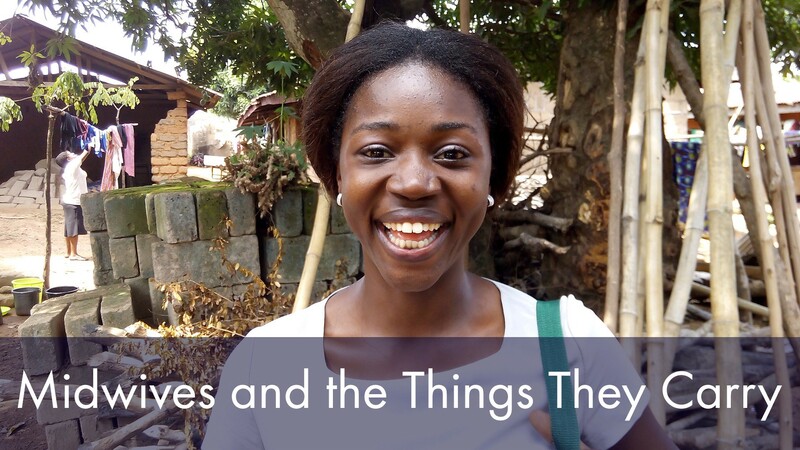 Linvell is a state registered midwife with a BS in Nursing and Midwifery from the University of Malawi. She practices 25 miles to the northwest of Lilongwe. Midwifery bag: For vital signs/antenatal care: Thermometer, stethoscope, sphygmomanometer, rapid malaria test kit, measuring tape, fetoscope, drugs (anti-malaria, Suplhadoxime-Pyrimethamine, Folic Acid, Ferros Sulphate, Albendazole, Paracetamol); For delivery: Sanitary pad, sterile gloves, urinary catheter, receiving cloth, identification band, cord clamp, razor blade, episiotomy scissors, dissecting forceps, Misoprostol, nag and mask, Penguin bulb suction, 5cc syringe, Lidocaine; For counseling/family planning: Balanced Counseling Strategy (BCS) cards, WHO Medical Eligibility Criteria wheel, Algorithm for BCS, Noristerat, Depo-Provera, Microgynon, female condoms, male condoms For records: client cards, pen. Chinwendu has her BS in Nursing and is a Registered Nurse Midwife. Delivery kit: One pair of gloves, two scissors, two forceps, cotton, two metal trays, one tray to hold cotton, one piece of gauze, two ligatures. Sarah attended the Kisiizi School of Nursing and the Kabale School of Comprehensive Nursing & Midwifery. She has both a certificate and degree in Comprehensive Nursing. Midwifery bag: Ambu bag, episiotomy set, gloves, blood pressure apparatus, fetoscope, vacuum, cervix model, syringe. Midwifery bag: Blood pressure apparatus, thermometer, fetoscope, delivery set (scissor, cord clamps, kidney dish, sponge forceps), placental kit, gauze, Nevirapine, forceps, cord tie, 2% Lidocaine, Pitocin , Ergometrine , Magnesium Sulfate, syringe with needle, Miso-fem, Manual Vacuum Aspiration set, boots, doctor shoes, delivery gown face cover, adult and neonatal Ambu bag with face mask, intrauterine device, Iodine tincture, galipot, contraceptive pill, Sinoplant, Implanol, wound plaster, role bandage, penile model, Saline, IV cannula, IV stand and set, surgical gloves, clean gloves, heavy duty gloves, solution, plaster, 70% alcohol, cut gut, condom, safety box, wash brush, drape, partograph, client personal folder(client chart), laboratory request, ultrasound request, vital sign recording sheet, VBAC /uterine scar follow up chart, Induction/Augmentation follow up chart, medication administration record sheet, immunization chart, appointment card, mucus extractor, Non-pneumatic Anti-shock Garment, breast pump, and waste container. These three midwives (pictured in order from left to right) work together and share the equipment above. Atsede, quoted below, has two and half years clinical experience at district and specialized hospitals. “I used a fetoscope for the first time when I was a third year university student during my [practicum]. It makes me really happy when I hear the heartbeat of the fetus through the fetoscope. For me, nothing is exciting as communicating with the fetus. Midwifery bag: Kidney tray, bowls, Ambu bag, fetoscope, hand rubs, normal vaginal delivery kit, blood pressure apparatus, emergency medicines, gloves, apron, partograph, gestational age wheel. Aasma attended an eighteen-month course to learn skills in community midwifery. This photo essay was created by Jessica Kerbo of USAID’s Maternal and Child Survival Program (MCSP). Want to learn more about our work? Visit MCSP on Facebook, Twitter, YouTube, or Flickr. *Some of the quotes have been slightly paraphrased to provide additional context. @USAID’s flagship Maternal and Child Survival Program (MCSP) is working with a focus on 24 priority countries to end preventable child and maternal deaths.